Since filmmaking is a collaborative medium, in addition to watching and writing about movies, my favorite cinematic pastime is discussing movies with others, whether it be via e-mail, phone or in person. As the founder and host of a library film discussion series with a patronage consisting primarily of film savvy senior citizens, I try to focus on bringing the audience contemporary independent and foreign works that are often overlooked by the mainstream. Frequently, patrons will tell me that while they certainly “don’t make ‘em like they used to,” they admire some of the new approaches used by filmmakers striving to respect audience’s intelligence and I’m always surprised in learning what works and what doesn’t in the eyes of an audience. As a film critic, it’s easy to get lost in the solitary art of watching a movie and analyzing it from one perspective and I’ve enjoyed appreciating the collaborative medium of film with an audience in order to step back from scholarly approaches to celebrate the wide array of cinematic offerings. However, both in discussing films with others and in an overwhelming majority of reader e-mail I receive (which, aside from spam, I DO read! ), I'm primarily asked to provide Top 5 and Top 10 lists of my favorite movies. It's a challenge that I always find daunting-- I'm drawn to lists myself yet I'm quite passionate and my rankings are forever changing so I frequently find I do better with topical lists. Instead of serving up a list of my favorite films which (to answer the top question) would probably consist of The Godfather, Vertigo, Singin' in the Rain, Modern Times, The 400 Blows, Red, Manhattan, The Umbrellas of Cherbourg, American Graffiti, The Graduate and others, I want to be sure to pay tribute to all of my favorites... and there are several. For as long as I've loved movies, I've realized you can tell a lot about a person based on their taste in Hitchcock. While I've always been a huge Vertigo fan, I've found that my best male friends and dates loved Rear Window, the romantics prefer Notorious (which incidentally are my top three faves) and so on. 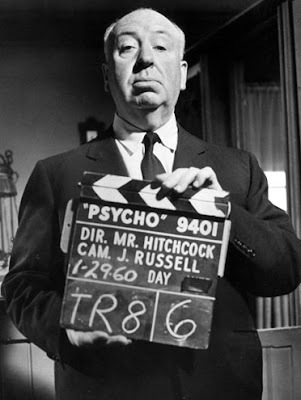 Without further ado, in honor of the Master of Suspense and to celebrate the fact that as my patrons say "they don't make 'em like they used to,"
Hitch has made so many amazing films that it pains me to realize what was cut from the list. You can explore his whole filmography by clicking here and also read more about his experimental film Rope (my 11th choice) by visiting Film Intuition's Articles Page. If you have an idea for the next list, would like to send me your choices, and for all reader mail, please click here to send me the feedback form. As always, thanks for your readership and shared interest in discussing films.